shawomet wrote: A couple of things come to mind. There should certainly be a difference in appearance, in patina, assuming the bone is mineralized to some degree, between a bone broken 130,000 years ago, and bones broken 25 years ago. If broken when it was already fossilized, 25 years ago, there should be a very noticeable difference in patina between the broken surfaces and non broken surfaces. Also, would the fracturing itself appear different if the bone was broken when the bone was still green or fresh, and when it was fossilized? I should think it would, since it would be the difference between fracturing bone, and fracturing stone(mineralized bone). I would also like to know who are the authorities, in terms of experience and eye honed for subtleties, where the causes behind fracturing bone is concerned. You're making sense to me there. Shawomet -- thanks for the reviews. Checked out the buzzfeed site and came across this person's complaint, an archaeologist who cited Haynes' complaint. I just responded to her. As a matter of clarity I would like to post her post along with my comment. It might clear some things up. It is not so much that a bulldozer cannot produce spiral fractures, but if it was the culprit, then it would have had to have broken the bones when they were green. It is not so much a sign of human versus machine here, but the state of the bone when fractured, like you said. CH: "As an archaeologist, you are of the opinion that green bone spiral fractures and fossilized/mineralized bone fractures are indistinguishable? That a bone smashed when it is still fresh fractures the same way when it becomes mineralized? Really? 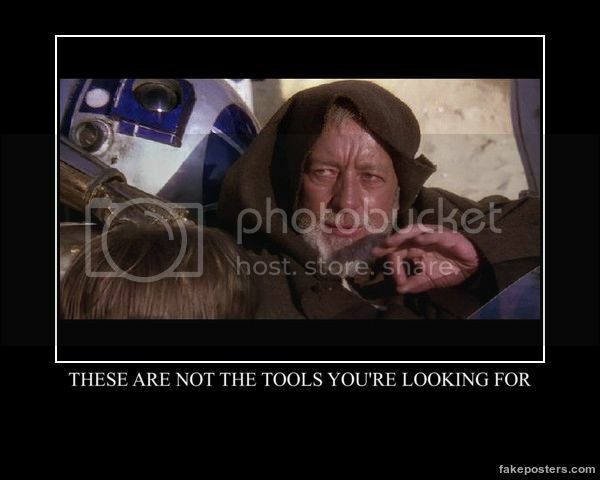 And you are a professional archaeologist who has explored this personally? Haynes is off his rocker if that is what he is saying. All you need to do is actual experimentation to find a fuckload of difference between the two fracture types. do your homework. look for yourself. btw, the initial bone discovered by "the bulldozer" was very small in appearance, confusing the monitor when he first saw it. He heard it first, of course, since the scraping sound of fossil bone is quite different from Bulldozer on mudstone. It was circular, round, and then he saw that it was probably a tusk, but if it was a tusk then that meant it was positioned vertically. Digging a profile, they found that the tusk cut through three vertical strata. ergo, when it was buried, it was sticking up vertically like a pole. What could do that in nature? That's why they called it an anomaly. So to get back to your original issue, the point is that spiral fracture happens only with green, fresh bone. A bulldozer would have had to have to run over a fresh bone or carcass to produce the spiral fractures -- that's the point. It is not the point that a bulldozer could produce spiral fractures on green bone. It is the point that IF a bulldozer runs over mineralized bones a 100,000 years later, it will NOT PRODUCE those spiral fractures. If a human bashed on mineralized bone, it will not produce those spiral fractures, either. The Point: the fractures had to have been made when the bone was green. So, now I put the question back to you: Are you arguing that there were bulldozers running around 100,000 years ago when the mastodon's bones were still fresh? Now that's a fairy tale. Spiral fracture of green bone 130,000 ya may exclude bulldozers but it doesn't necessarily infer Homo did it . 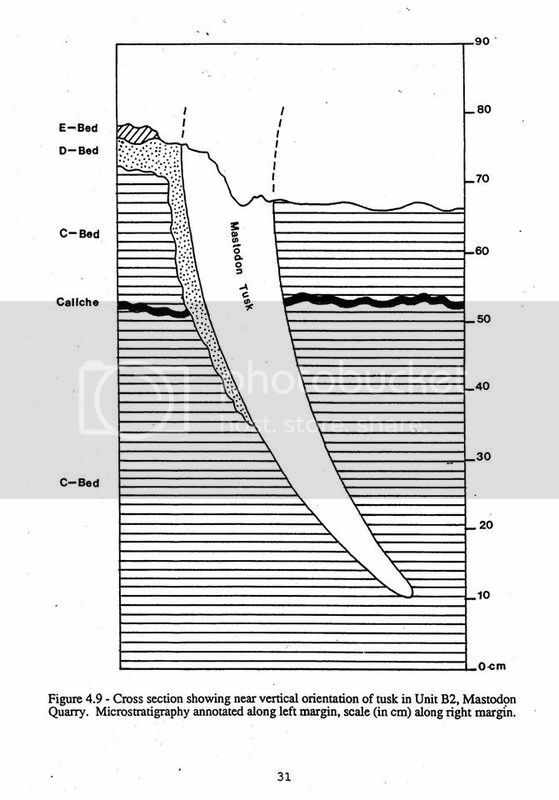 Digging a profile, they found that the tusk cut through three vertical strata. ergo, when it was buried, it was sticking up vertically like a pole. What could do that in nature? That's why they called it an anomaly. The upright tusk always fascinated me since it seemed almost like it was stuck in the ground as a marker. Either that, or somebody had nothing better to do at the time. Hard to believe natural forces would do that, though. Does anyone have a drawing of its position? in contrast to that required for recent impacts. in the form of hard data. Determining the rate of impacts also is more significant, as it requires changes in spending in science, whereas this find does not. I suppose that in the end it MAY come down to possible transport mechanisms for the rocks which have been found at the site. Didn't the star of a Hollywood movie commit suicide to prevent an impact? A hit movie may qualify as "popular discussion." YO, Cognito. This is from the '95 report. Apparently, the other tusk is lying near the upright tusk. Makes me wonder what natural forces would bury the pictured tusk vertically. but that means Mike doesn't believe in anvils or hammerstones. he has a big problem when he states there was no stone tools in his letter to the team. a very idiotic statement based on the fact there were no proper flakes at the site. this has driven most of the ex-Clovis guys off the edge ... which is a good thing. Bone tools and bone flakes have been known about for over 100 years. The debate over this site will be incredibly instructive.